Slice the eggplants in half and coat them with all but 3 tbsp of salt. Cover with paper towels and place a weight on them to drain. Let sit 15 minutes. Dice tomato, onions and mince garlic. Saute until garlic is brown and onions are golden in 1/2 cup olive oil. Add parsley, lemon juice, sugar, salt and paprika to taste to the tomato mixture. Cook until about the texture of jam. Scoop out a hollow in the center of each eggplant half. Wipe away the salt. Place 2 of the eggplant halves face down in a skillet w/ half of remaining olive oil, cook until browned and olive olive oil is absorbed. Repeat using other halve and remaining oil. Place the eggplant halves in a baking dish and fill the hollows with tomato mixture. Place in 400 degree oven for twenty minutes. Serve, garnished with paprika. Alternately, the eggplant can be chopped and sauted in chunks until soft and brown. 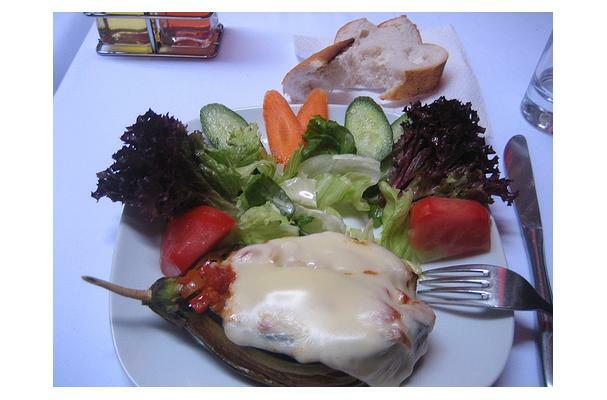 In that case the baking step is omitted and the eggplant is simply mixed with the tomato mixture.